Posted under Health Guides. Updated 12 April 2017. The “Freshman 15” refers to weight gain during the first year at college. During freshman year, some students will gain weight, while others will lose weight or stay the same. Weight maintenance involves making healthy food choices, exercising regularly, and limiting late night eating, junk food, and alcohol. The “Freshman 15” is the myth that college students will gain fifteen pounds during their first year at school. The fact is that some students will gain weight (on average, between 3 and 10 pounds during freshman and sophomore year), and others may lose weight, or stay the same weight. There are many changes that happen during the first year of college that can affect your eating and exercise habits. For example, eating your meals in an all-you-care-to-eat dining hall with friends is very different from eating meals at home with your family. You might experience significant amounts of stress due to being away from home or the workload of classes which can cause people to turn to food for comfort. Also, many people who played sports in high school don’t play sports in college, so they don’t have exercise built into their day. Although these changes may take some getting used to, it doesn’t mean that they have to result in weight gain. What behaviors can contribute to weight gain? 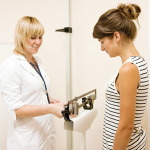 How can I maintain a healthy weight when I am in college? Eat nutritious snacks. Stock your room with healthy snacks such as string cheese, baby carrots, hummus, yogurt, light popcorn, granola bars, and nuts. It’s okay to eat junk food occasionally, but cut back on chips, soda, and sweets. Try bringing fruit or other healthy snacks back from the dining hall to eat later. Choose healthy options. Since you will probably be eating most of your meals in the dining hall, get in the habit of choosing healthy options and eating balanced meals. Look for plant-based or lean proteins and choose whole grains such as whole grain bread, brown rice, and whole grain pasta. Be sure to eat fruits and vegetables at every meal and try to make them half of your plate. Limit foods that are fried and/or made with lots of added fats, sugar, and salts. If you’re not sure how a dish is prepared, you can always ask the chef or food service manager. Plan ahead. Think about when you have time to visit the dining halls and when you will need to pack meals or snacks to take with you to class or your other activities. By planning ahead, you can make sure that you will have food when you are hungry and you can make healthier decisions instead of impulse purchases. Eat when you’re hungry and stop when you’re full. All-you-care-to-eat dining halls can contribute to overeating. Be conscious of how much you are eating (not just what you are eating) and eat until you are comfortably full, but not stuffed. Even if the cafeteria is serving lots of your favorite foods, try to stick with one entrée. You can always choose something different next time. Make mindful decisions when eating late at night. It’s okay to eat a small snack at night if you are hungry, but eating late night meals when you aren’t really hungry can lead to weight gain. Be active. Even though you might not have gym class or after school practice anymore, you can still be physically active! Find ways to fit physical activity such as walking, biking, dancing, or playing sports, into your schedule. Consider making a gym date or sign up for an intramural sport. Find a friend who shares your goal of wanting to stay in shape and make plans to work out or go for a walk/run together. Not only will it keep you fit, but you’ll also build new friendships. Being active will give you more energy and can also help you deal with stress. Think before you drink. Alcoholic beverages contain lots of calories. Drinking alcohol can also lead to loss of judgment, which may also cause some people to over-eat late at night. Be aware of your stress level. If you find yourself frequently eating when you’re not hungry you might want to check in with your level of stress. Are you feeling sad about being away from home? Is the workload of your classes overwhelming? In these cases you might want to talk to someone in the school counseling center. They can help you identify ways to decrease your stress level. Remember to eat balanced meals that include lean protein, whole grains, and plenty of fruits and vegetables. Watch your portion sizes and eat until you are comfortably full, but not stuffed. If you are still concerned about your weight, you can always contact a registered dietitian to help design a healthy weight management program that’s right for you. Staying physically active will help you maintain your weight, increase your energy level, and help reduce stress.